In 1066, Goring (the name is believed to derive from the Old English word garmeaning spear) was controlled by Wigod, Thane of Wallingford, and Streatley by Asgar the Staller, an official at the court of Edward the Confessor. Following the Norman Conquest, Goring passed to Robert D'Oilley who came over with William and married Wigod's daughter. Streatley went to Guy de Mandeville, a hard man. In 1086, the Domesday Book valued Goring (then called Garinges) at £15 and Streatley at £24. Streatley probably had an Anglo-Saxon church (St. Mary's) at the Conquest; Goring's church dates from 1100 and still exhibits its Norman origins. It was probably dedicated to St. Mary but later changed to St.Thomas (Becket). The Augustinian Priory of Goring was founded about 100 years later, and the nuns were given the rights of Streatley ferry and mill. Farming was the major occupation then, and bad harvests meant famine and often death. The Black Death struck in 1348-9 and also reduced the population. Goring Priory was dissolved in 1536 when only the Prioress and three nuns were left. Its stones and timber were undoubtedly slowly recycled into other buildings in the locality. The river had always been a major highway as well as a power source for water mills. In the 17th century, interest in Thames navigation was expanding as the growth of London demanded ever more commodities of all kinds, and goods could reach the heart of the capital by river. However, locks and a good flow of water were necessary. In 1787, pound locks replaced the flash locks at Goring and Cleeve. In the early 19th century, Streatley was larger and more important than Goring because it was on the turnpike road to Reading. The post house is now the Bull Inn. A toll bridge over the river was built in 1837, and in 1840 the Great Western Railway opened Goring Station. The first school was opened in Streatley in 1834 and in Goring in 1850. As each village became more accessible and fashionable, a number of palatial houses appeared by the end of the century. A new bridge, free from toll, replaced the original in 1923. Streatley Mill burned down in 1926. The Streatley Estate, owned by the Morrell family (brewers in Oxford) was sold and split up in 1939. In 1955, main drainage arrived in the villages and heralded the changes we see today. The demolition of some of the large houses began and made way for modern estates, enabling the population to double since 1900. 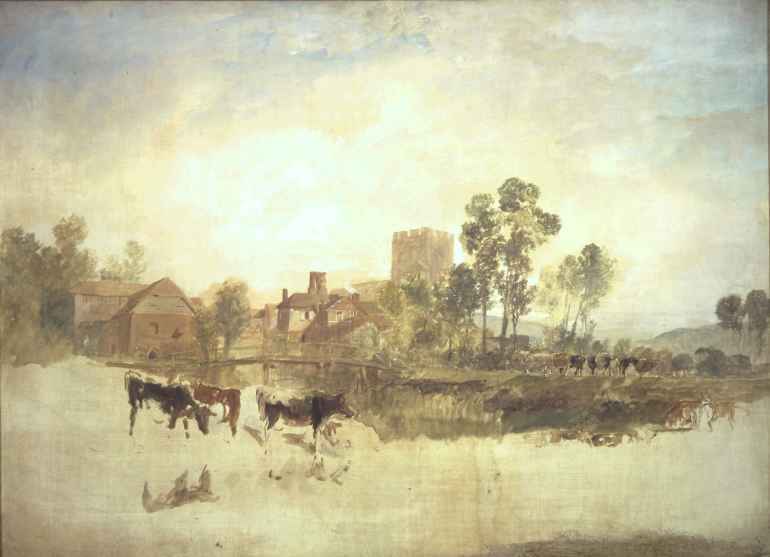 This painting of Goring Mill and Church is one of a group of unfinished scenes of Thames-side landscapes painted in 1805, during Turner's campaign of open-air painting and sketching along the river. It is painted in thinly-diluted oils over a white primer to give luminosity to the colours. The original can be seen as part of the permanent collection at Tate Britain, Millbank, London.